Kaneto Shindo, one of the prominent filmmaker and writer, passed away on May 29, 2012. He was 100 years old. He was the last to live through the golden age of Japanese cinema and his film career spans over almost 8 decades. He has directed numerous masterpieces such as “The Naked Island” or “Children of Hiroshima“, to name the few. He also engaged in documenting some (Japanese-cinema related) historical events. This documentary is at the crossroad of his interests; it is about the troop of independent film actors and also about tragic event in Hiroshima, Shindo’s hometown. Sakura-tai (Cherry-Blossom Troop) was formed by the band of actors and actresses during WWII. Entertainment industry was considered unfit for the national sentiment at the time and film industry was under severe restriction. Many actors looked for the opportunities in traveling theaters, to which government officials didn’t object harshly. Sadao Maruyama was the central figure of Sakura-tai, one of such traveling theaters formed in early 1945. They happened to be in Hiroshima on that fateful day and most of the troop members died by the end of August. The film is juxtaposition of interviews and enactment of the tragic events in B&W. B&W images stretch the visual scale for the physical features of radiation injuries, such as bleeding, rashes or hair loss. These images do cause unpleasant sensation in us, (at least in my case). 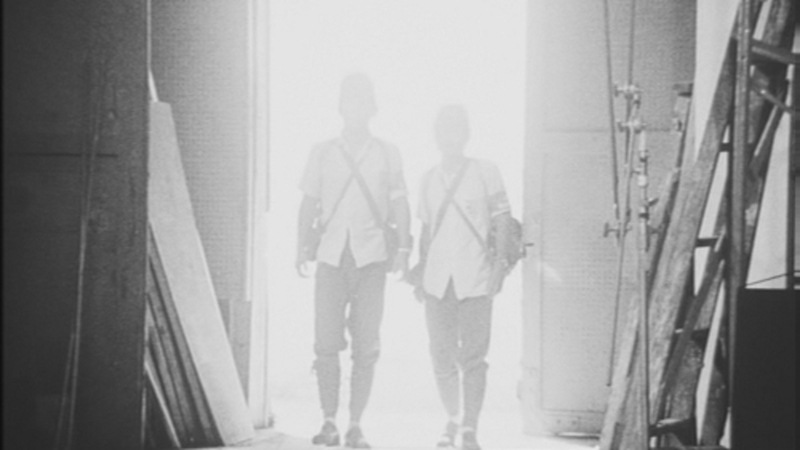 Most of the Shindo’s films about the perils of nuclear radiation are filmed in B&W, for he was looking for this effect (Shohei Imai’s “The Black Rain” was also in B&W). One of the victims in Sakura-tai was Keiko Sonoi, who starred in the Inagaki’s first version of “Muho-matsu no issho (1943)“. This tragic masterpiece carries many gems, and her presence is one of them. I have to say I am not convinced of Takamine’s performance in the remake, “Muho-matsu no Issho (Rikishaw-man, 1958)” after watching Sonoi’s excellent acting, and it is all the more regrettable that she had to be there on August 6.